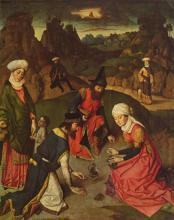 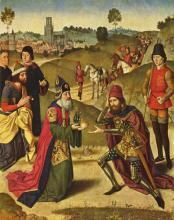 Dieric Bouts, also spelled Dirk, Dierick and Dirck (c. 1410/1420, d. 1475) was a Netherlandish painter. 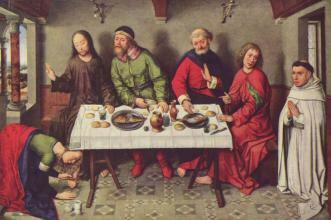 According to Karel van Mander (Het Schilderboeck, 1604), Bouts was born in Haarlem and was mainly active in Leuven (Louvain), where he was city painter from 1468. 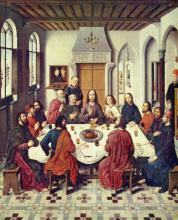 Van Mander confused the issue by writing biographies of both "Dieric of Haarlem" and "Dieric of Leuven," although he was referring to the same artist. 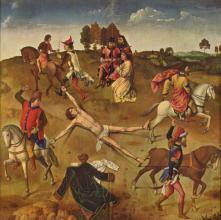 The similarity of their last names also led to the confusion of Bouts with Hubrecht Stuerbout, a prominent sculptor in Leuven. 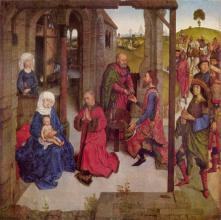 Very little is actually known about Bouts' early life, but he was greatly influenced by Jan van Eyck and by Rogier van der Weyden, under whom he may have studied. 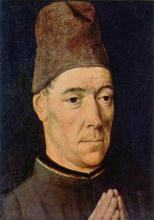 He is first documented in Leuven in 1457 and worked there until his death in 1475. 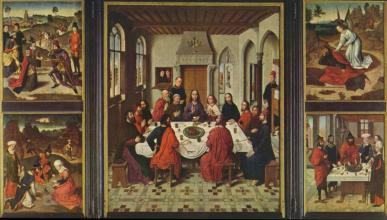 Bouts was among the first northern painters to demonstrate the use of a single vanishing point (as illustrated in his Last Supper). 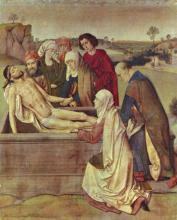 His work has a certain primitive stiffness of drawing, but his pictures are highly expressive, well designed and rich in colour.